That looks like one NASTY burn. Is that just 1st degree? because it looks like blistering there 2-3 degree. That will be a bugger when you go to shave next. Thanks mate. Yep...did plenty of "weak side" shooting, but its been an awful lot of years. Funny thing though, even when shooting weak side I still used my right eye for the sights. Its getting better mate, albeit very slowly. If I have to, I will change over to be a lefty though. The burn is caused by the machine that they use to do the Radio Therapy. From what they tell me, they are "shooting" a beam of electrons into a precise depth and place. Unfortunately one of the side effects is the burn. No blisters, just very dry skin. The only way they tell me to treat this is heaps of moisturising cream containing a skin repair agent...probably like Vitamin E...and not using everyday soaps etc. I also have aloe vera growing in my garden so I cut a leaf every couple of days, split it and smear the gel from inside the leaf onto the burn area. Very soothing and also healing. The Dr is happy with the way the burn is going, she says it is not nasty at all well compared to what some people get. Yeah Aloe vera is good for burns. Glad to hear that it is healing well mate! Just on time for the 10,000 party too..
Not healing yet mate...wish it was...have another 3 weeks (15 visits and "zappings") of treatment to go. Don't know how much worse the burn is gonna get...but I do know it ain't gonna heal for at least 5 or 6 weeks. Vince, I sure hope your ordeal as a quick resolution. Get better soon. Thanks Moose and Dallan...I can only hope that things settle down ASAP...I have plans that involve shooting and hunting, and right now I cannot put a rifle or shotgun anywhere near my cheek...too painful...most frustrating I can tell you. Yeah vince, Pumps is right there! Seriously though...I agree wholeheartedly, but one thing I learned early in life is that banging your head against a brick wall only hurts the mug that's doing it...in other words, it would be a total complete and utter waste of time and effort because the Govt would take no notice. Having said all that...I think it is a great idea as I really miss my pistols... they were great fun. Vince, sounds like shooting a 22LR weak side is your best starting point. Or get a lever-action and shoot from the hip so you can become the next "Rifleman"! Maybe start out shooting at large water jugs. What a damn fine idea Slim. I have a Mod 94 in 30.30, move over Chuck...Vince is here. 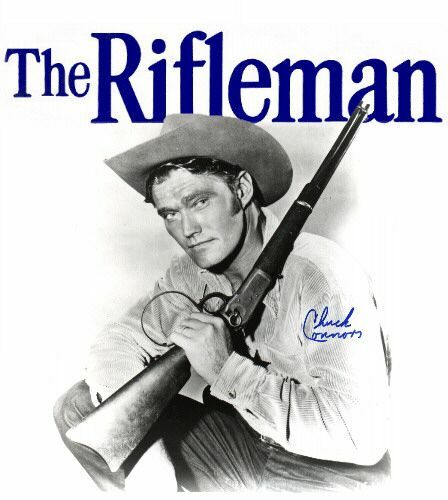 Oh bugger...Chuck Connors is a lefty too...don't 'spose there's any excuse now. 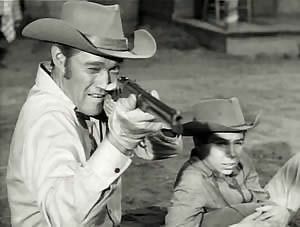 The Lucas McCain carried a 44-40 rifle in the series. It was my favorite TV show followed very closely by Gunsmoke.